With summer in full swing, we’re finding ourselves drawn to fun and fresh campaigns. Traditionally, the summer can be a quiet time on campus with dorm rooms lying empty and lecture halls becoming a bit of a ghost town. However, a deserted campus should never equate to a deserted social media calendar. 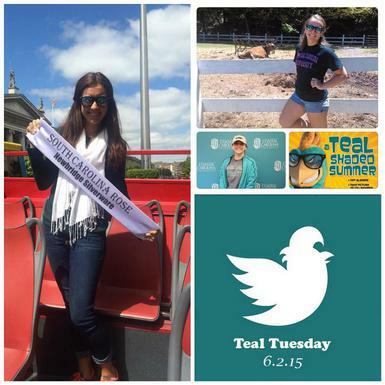 We wanted to share Coastal Carolina University’s really excellent social media campaign “A Teal Shaded summer”. The premise of the campaign is simple; students send in pictures of themselves wearing special teal coloured sunglasses in various locations around the globe and the university then post them to social media. Coastal Carolina has got their social media strategy pretty much sewn up with engaging, fun and creative campaigns such as their ‘vote for the best decorated graduation cap contest’ on Facebook to their CCU contest on Snapchat. This is one university that serves as a prime example for how social media can help your university develop and maintain a lasting relationship with current, future and past students. Social media can help put a face to the name so to speak and fun and engaging campaigns are what help students understand the personality of your institution. We’ve included some of the great posts from the “A Teal Shaded Summer” below and don’t forget to check out their Twitter , Facebook and Instagram. P.S. Don't forget to complete the 2015 Higher Education Web Survey. It only takes a minute and you never know you might even win a prize!